Julington Creek, Florida, is an unincorporated community situated in the northwestern corner of St. Johns County. It is located near the creek with the same name. The area is served by the highly ranked St. John's school district. The students here maintain some of the highest FCAT average scores in the state. The sprawling Julington Creek Plantation master-planned community is situated here. The 1200-acre Julington Creek Plantation development is also known simply as "The Plantation" or just "JCP." Much of the available Julington Creek FL real estate is located at JCP. In 2005, North Florida Families Magazine named it the "Best Community for Families." Many relocating families will want to check out the Julington Creek homes situated along the fairways of the championship golf course. Many of the Julington Creek homes for sale here are of newer construction; many range in size from 2000 to 3000 sq-ft and more. The discriminating Julington Creek home buyer will find an occasional large mansion on acreage in this unincorporated community. Young families seeking starter homes will find 1000 to 1800 sq-ft homes with two to three bedrooms, some of rather recent construction. Oftentimes, Julington Creek real estate on the market includes Julington Creek FL homes that are beautifully framed by sprawling massive oaks. The homes for sale in Julington Creek also include many with beautiful tall pines standing as sentinels across the Julington Creek properties. 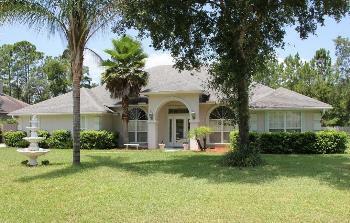 Much of the residential real estate in Julington Creek features lush landscaping as well. The 19th century settlement of the area included citrus farmers drawn here by fertile soil and a temperate climate. The steamboats on the St. John's River would transport fruit and produce to waiting markets in Jacksonville and even more distant locales. A great place to get away from it all is where the Julington and Durbin Creeks merge. The resulting peninsula is now home to the Julington Durbin Creek Preserve. Here, one can hike, bike, walk dogs, and ride horseback. Enthusiastic golfers may want to check out the Champions Club at Julington Creek which works its way in and around the neighborhoods at the plantation. This public course features a clubhouse with Spanish Colonial Revival architecture. The well-maintained 18-hole layout features expansive white sand bunkers, tall pines, and expansive oaks. The Julington Creek Recreation Center is a $15 million facility that includes free weights, fitness classes, clay court tennis, basketball courts, playground, a skateboard park, and a fishing pond. Childcare is also available. The center also features a competition-quality pool. The eight-lane infinity design includes a Paragon starting block and, during competitions, a Colorado touchpad. At the turn end of the pool there is also an eight-lane Colorado scoreboard. Julington Creek also offers a nine-acre pet facility, the Julian Creek Animal Walk that is unlike any other. This is an off-leash facility that is double-gated and latched to keep canine guests secure. Area residents can head to the St. Augustine amphitheater for numerous concerts by major performers. Or, residents can head east to the Ponte Vedra Concert Hall to enjoy well-known acts in an intimate setting.